How often do you find people from politicians to primary schoolchildren referring to 'fairy tales' as though they are a single, undifferentiated genre? 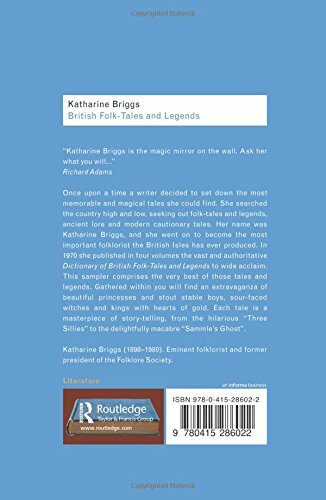 Way back in the early 1970s the folklore scholar, Katharine Briggs, was at pains to demonstrate the many varieties of such narratives, and her majestic four-volume Dictionary of British Folk-Tales not only made careful discriminations between different kinds of story but also served as a compendium of texts and sources. In 1977 this huge, but unwieldy, collection was boiled down to the more manageable volume which is now reissued in Routledge's sturdy, well-produced softback series of 'Classic Authors'. The eighteen main divisions of the original are retained, along with Briggs's explanatory introductions and her reprinting or summarising of outstanding examples with some notes on sources and the interrelationship between tales. The indexing, cross-referencing, and bibliographical guidance leave much to be desired (what's the use of merely 'Ruth L Tongue Somerset Folklore pp 29-30'?). Readers whose interest will be justifiably stimulated by the book ought to be told more of the publishing, dating and status of its essential elements. Nonetheless, one might be in mortal danger to deny the pleasures and the insights afforded by so many wonder-tales, and if you set the book alongside that other fine collection, Neil Philip's Penguin Book of English Folktales (1992) as a kind of analytical companion, you will have a perfect introduction to the splendours, the mysteries, and the comedy of our numinous past. 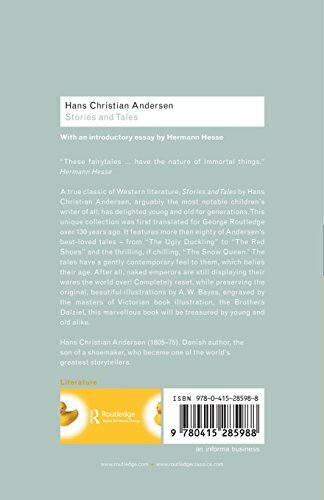 No such recommendation can be made for the Andersen in Routledge's series. Dulcken's translation of sixty-two of the eventyr (certainly not fairy tales) must be one of the worst ever. The wood engravings after drawings by Bayes are worth seeing as examples of the Victorians' narrative and graphic skills in illustration, but they have suffered somewhat through modern reproductive processes.